Dezen Dezen — For the love of Scarves! Accessorizing a look can be extremely difficult but, when in doubt, we believe in the power of the scarf! Just throw one over your coat, cardigan or T-shirt and you can transform your look from plain to interesting in a second. They add the perfect splash of color in a minimal look and they can complement a maximal one. Beyond their elegance scarves can protect you from a light breeze to heavy cold depending on the material they are made of. For our Dezen Dezen Scarves we rely on some of our historic suppliers from Como, an Italian city world-famous for its silk-manufacturers and high-quality scarf production. We handpicked unique blends that can suit any season and look and we brought them to our Trieste workshop. Here we hand-printed our signature dezens on the scarves, following the family tradition of silk-printing and using only environmentally sustainable methods and inks. On our shop you can find four different types of scarves to go with every style and season. 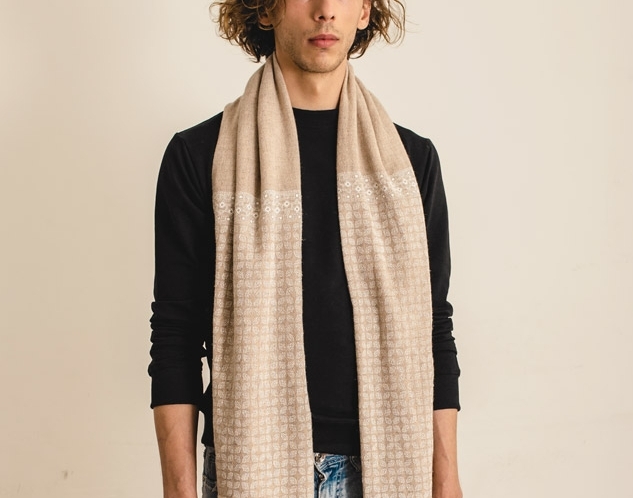 First, our viscose and cotton blend scarf can complement your summer or spring looks. Soft and light, it comes in 4 basic colors that fit every outfit. Perfect for every season instead, is our modal-cashmere blend, in which we added a bit of wool and silk for softness. It can be worn over your coat in autumn or at a chill night in spring or summer. This scarf comes in many vibrant colors that can be easily combined with your garments throughout the year. If a pashmina is your go-to accessory we have you covered. Our modal and cashmere blend feels soft, light and luxurious and adds an elegant touch to every look. We have chosen earthy and minimal colors for this classic piece. Living through the cold Trieste winter, we couldn't have left out a heavier, warmer blend for our scarves. Wool, viscose, polyamide and a touch of cashmere make up our winter scarf, perfect for cold days and nights. Find our scarves in our workshop or shop online your favorite ones. Are we wrong to consider scarves the ultimate accessory?